A new report called Safety Effectiveness of Intersection Left- and Right-Turn Lanes (RD-02-089) from the Federal Highway Administration presents the results of research on the safety effectiveness of providing left- and right-turn lanes for at-grade intersections. (1) The research was performed as part of a pooledfund study; highway agencies in the District of Columbia and the States of Iowa, Illinois, Louisiana, Minnesota, Montana, Nebraska, New Jersey, North Carolina, Oregon, and Virginia all contributed a portion of the funding for the research. The research began with a review of published literature related to the safety effectiveness of intersection design and traffic control elements. This review summarized current knowledge on the safety effects of a broad range of intersection features. Safety effectiveness estimates exist for many features. In many cases, however, the validity of those estimates is in question, because the estimates were based on studies that were poorly designed and executed. Based on the literature review, representatives of the participating States decided that the research should focus on quantifying the safety effectiveness of left- and right-turn lanes through a well-designed before-after evaluation. Researchers identified and selected three types of sites for the study: improved or treatment sites, comparison sites, and reference sites. The database assembled for the study included 580 intersections of these three types, as explained below. Added left- and right-turn lanes at the same intersection. Extension of the length of an existing left- or right-turn lane. The study was limited to projects at three- and four-leg intersections. All of the evaluation sites had either two-way STOP control or traffic signal control. All of the improvement projects evaluated were constructed during the years 1989 through 1998; the vast majority of the sites were improved during the period from 1994 through 1997. The intersections were located in eight of the States that participated in the study: Illinois, Iowa, Louisiana, Minnesota, Nebraska, North Carolina, Oregon, and Virginia. The States supplied traffic volume and accident data for the study and permitted the research team to visit the sites and document intersection features. For 260 of the 280 improved intersections (93 percent), researchers selected a matching comparison site that was not improved during the study period. The matching improved and comparison sites were always in the same State and were located geographically close to each other whenever practical. The matching sites were as similar to each other as possible in intersection configuration, traffic control, geometric design, and traffic volume. The other 20 improved sites were sufficiently unique that researchers could not find matching comparison sites. In addition, researchers selected 40 reference sites. Reference sites were unimproved intersections that were not matched to any particular improved site. Researchers collected extensive data for the improved, comparison, and reference sites. Field visits to nearly every study intersection provided geometric design and traffic control data. Traffic volume data for both the major- and minor-road legs were obtained from counts or estimates for as many years as possible for each intersection from highway agency records. Intersections were only included in the study if average daily traffic volumes for the major and minor roads were available for at least one year during the study period. Traffic volume estimates for each individual year of the study period were obtained through a careful process of interpolation and extrapolation. Researchers evaluated traffic accident records for each participating highway agency for periods before and after each of the improvement projects. The evaluation generally included all accidents within 75 m (250 ft) of each intersection that were related to the presence of the intersection, as designated by the investigating officer or accident coder. The database assembled for the 580 study intersections included a total of 26,056 intersection- related accidents (123 fatal accidents, 10,203 nonfatal injury accidents, and 15,730 property-damage-only accidents). The accident database used in the study included 9 to 13 years of data for each intersection. Study periods before and after each improvement project were defined with durations as long as possible, consistent with the availability of data. The data for the year in which the project was constructed were not included in either the before or after study period. The before study periods for the treatment sites ranged from 1 to 10 years, with a mean duration of 6.7 years. The after study periods also ranged from 1 to 10 years, with a mean duration of 3.9 years. Before-after evaluation with yoked comparisons. Before-after evaluation with a comparison group. Before-after evaluation with the Empirical Bayes approach. These approaches were developed from those recommended by Griffin and Flowers(2) and by Hauer. (3) The yoked-comparison (YC) approach is a traditional approach to the evaluation of traffic accident countermeasures and involves one-to-one matching between improved and comparison sites. The safety performance of the matched comparison site is used to estimate what change in safety would have occurred at the improved site had the improvement not been made. The comparison- group (CG) approach is similar to the YC approach but replaces the single comparison site matched to each improved site with a group of similar sites whose collective safety performance serves the same purpose. The Empirical Bayes (EB) approach replaces the comparison group with a negative binomial regression model used to predict the change in safety performance of the improved site that would have been expected had the improvement not been made. 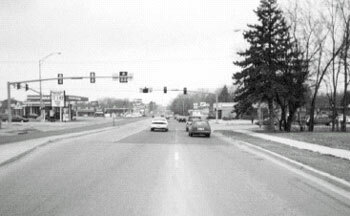 When an intersection has relatively high accident experience during a particular time period, its annual accident frequency is likely to decrease even if it is not improved; this phenomenon is known as regression to the mean. Thus, when an improvement project is constructed at an intersection with relatively high accident experience, the natural decrease in accident frequency due to regression to the mean may be mistaken for an effect of the project. Thus, regression to the mean is a major threat to the validity of before- after evaluations. The EB approach is the only known technique to account for the effect of regression to the mean on evaluation results. The YC and CG approach can account for the effects of changes in traffic volume levels and for general time trends in accident frequency, but not for regression to the mean. The CG approach is generally preferable to the YC approach, because the CG approach uses multiple comparison sites for each improved site and because, as implemented in this evaluation, it has a more sophisticated method to account for traffic volume changes than the YC approach. Thus, the ranking of the three evaluation approaches, in descending order of their theoretical accuracy, is EB, CG, and YC. The evaluation results confirmed this expected relative accuracy of the three methods. Tables 1 and 2 summarize the safety effectiveness of installing left-turn lanes on the major-road approaches to rural and urban intersections, respectively. Table 3 presents comparable effectiveness estimates for rightturn lanes that are applicable to both rural and urban intersections. The safety effectiveness of adding turn lanes is presented in the tables as the expected percentage reduction in total intersection accidents. All of the results in tables 1 through 3 were derived in the current study except where noted; the full research report includes estimates of the precision of each of these results. (1) Effectiveness measures for situations not addressed in the current study were based on the findings of an expert panel convened to assess published literature in another recent FHWA study. (4) Furthermore, all of the results from the current study shown in tables 1 through 3 are based on the EB approach, with one exception noted in table 2. The effectiveness of projects involving the addition of both left- and right-turn lanes on the major road at the same intersection can be determined by combining the relevant effectiveness measures from tables 1 through 3. For example, at an urban four-leg signalized intersection, the addition of two major-road left-turn lanes would be expected to reduce total intersection accidents by 19 percent, and the addition of two major-road right-turn lanes would be expected to reduce accidents by 8 percent. The combined effectiveness would be computed as 1-(1-0.19) (1-0.08) = 0.25, or a 25-percent reduction in total intersection accidents. No reliable effectiveness measures were found for extending the length of an existing left- or right-turn lane. · Fatal and injury accidents — $103,000. ·Property-damage only accidents — $2,300. The average cost of installing a single left-turn lane is $85,000 based on estimates from four of the States that participated in the study. 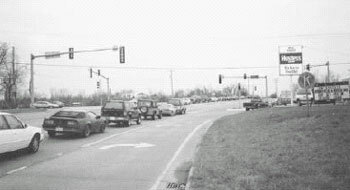 For rural three-leg unsignalized intersections, the results indicate that left-turn installation would become cost-effective for a major- road ADT of 4,000 vehicles/ day with 10 percent of the major-road volume on the minor road and at 2,000 vehicles/day with 50 percent of the major-road volume on the minor road. For rural four-leg unsignalized intersections, left-turn lane installation would become cost-effective for a major-road ADT of 3,000 vehicles/day with 10 percent of the major-road volume on the minor road. With a minor- road volume equal to 50 percent of the major-road volume, left-turn installation would be cost effective at all of the major-road volume levels down to the lowest level considered of 1,000 vehicles/day. For urban four-leg unsignalized intersections, left-turn installation would become cost-effective for a major-road ADT of 2,000 vehicles/day with both 10 and 50 percent of the majorroad volume on the minor road. For urban four-leg signalized intersections, left-turn installation was found to be cost-effective for all combinations of majorand minor-road ADTs considered. The lowest combination of major-road ADT of 10,000 vehicles/ day and minor-road ADT of 2,500 vehicles/day has a benefit- cost ratio of 1.5. Harwood, D. W., K. M. Bauer, I. B. Potts, D. J. Torbic, K. R. Richard, E. R. Kohlman Rabbani, E. Hauer, and L. Elefteriadou. Safety Effectiveness of Intersection Left- and Right-Turn Lanes, Report No. FHWARD- 02-089, Federal Highway Administration, July 2002. Griffin, L. I., and R. J. Flower. "A Discussion of Six Procedures for Evaluating Highway Safety Projects," Federal Highway Administration, December 1997. Hauer, E. Observational Before-After Studies in Road Safety, Pergamon/Elsevier Science, Inc., Tarrytown, New York, 1997. Harwood, D. W., F. M. Council, E. Hauer, W. E. Hughes, and A. Vogt. 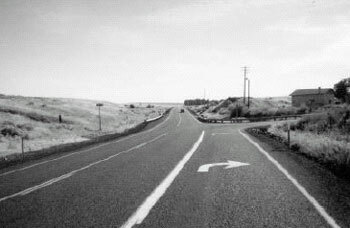 Prediction of the Expected Safety Performance of Rural Two-Lane Highways, Report No. FHWA-RD-99-207, Federal Highway Administration, December 2000. Research—This research study was performed as part of a pooled fund study; highway agencies in the District of Columbia and the States of Iowa, Illinois, Louisiana, Minnesota, Montana, Nebraska, New Jersey, North Carolina, Oregon, and Virginia all contributed a portion of the funding for the research. Distribution—This TechBrief is being disseminated according to standard distribution. It will also be displayed on the TFHRC Web site, https://www.fhwa.dot.gov/research/tfhrc/. Availability—The report on this study is available on the TFHRC Web site in the Research Library. Copies will be available from the National Technical Information Service, 5285 Port Royal Road, Springfield, VA 22161. Key Words—left-turn lanes, right-turn lanes, intersection, safety. Notice—This TechBrief is disseminated under the sponsorship of the Department of Transportation in the interest of information exchange. The TechBrief provides a synopsis of the study's final publication. The TechBrief does not establish policies or regulations, nor does it imply FHWA endorsement of the conclusions or recommendations. The U.S. Government assumes no liability for the contents or their use.